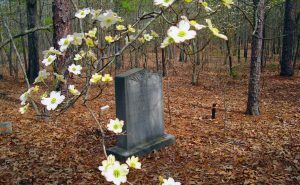 The establishment of the Argyll Colony in the Cape Fear valley of the Carolinas in 1739 was an important event in the history of Scotland and America. It was for some time the largest settlement of Scottish Highlanders anywhere outside of Scotland. Why did people leave their native homes in Scotland for an unknown land? What did they think about their experiences in America? When examining any immigrant group that has formed over several generations, we need to allow for the diversity of the experiences and backgrounds of the people themselves. No group is entirely homogenous. All societies have different social strata, specialized professions, gender roles, and so on. New customs, foods, technologies and ideas can enter a society through a neighboring community, or through an internal institution (such as schools or churches). The resulting changes can impact a society in many unforeseeable ways. This is particularly true in the case of the immigrant community of Scottish Highlanders of the Cape Fear that was founded in the late 1730s and continued to take in new immigrants into the early decades of the 1800s. During that time, Highland society in Scotland was undergoing a dramatic transformation in nearly all of its aspects: economics, education, language, religion, and social structure. Despite this, there are some generalizations we can make that cut across the divisions of Highland society and describe the motivations for leaving Scotland and the impressions of life in their newly adopted country, America. These observations are supported by their own words in prose and poetry in English and in their own native tongue, Scottish Gaelic. Although the mass of Scottish Highlanders never had any reason to leave their home communities where their ancestors had lived beyond the recall of tradition, there has always been an elite segment of Gaelic society which has been highly educated and well traveled. 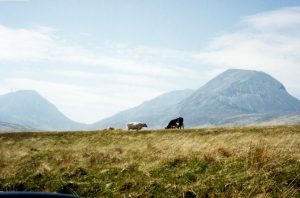 The cattle droving business developed in the Highlands during the seventeenth century, allowing some members of the native middle class to increase their wealth by gathering huge droves of cattle from every corner of the Highlands and accompanying them to markets in the Scottish Lowlands. New links across the Irish channel were forged by the Plantation of Ulster, for Gaelic-speaking Highlanders were among the many Protestant colonists settled by the Crown’s plan for the subjugation of Ireland. Looking further back in time, there were centuries of travel between the western Highlands and Ireland: Highland chieftains hired out their extra military might as “redshanks” (mercenaries) to Gaelic chieftains in Ireland, and also recruited members of the professional learned classes who had been trained in the bardic schools of Ireland. In addition, the Scots in general had always had ties of various sorts to continental Europe, whether related to religion, military or education. An estimated 30,000+ Scots left for Poland between 1600 and 1650 alone. As the Highland elite became increasingly influenced by and integrated into the centralized British state, they began to adopt the values and practices of the English-speaking world. The biggest impact was social and economic. Highland society had been a pastoral subsistence economy, loyalty was local and familial, and kinship an overriding factor in the running of the community. The Highland elite, however, was becoming involved in a cash economy, which required them to generate a surplus product for export to markets outside the Highlands. This led to raising rents and minimizing overheads, which ultimately meant abandoning the human population which in previous ages had been the foundation of their status and wealth. It was the men of the middle class — the “tacksmen” as they were called in English, or fir-bhaile in their native Gaelic — who were the first to respond to these social and economic destabilizations. They knew that they were, as a class, being squeezed out of existence. Beyond this, they tended to be literate in English and were used to being administrators and leaders. As they anticipated that the new regime would bring about a reduction in their quality of life, they had the greatest incentive to organize migrations which would take them and their subtenants to new lands. As early as 1729, Archibald Campbell, an agent for the Argyll estate, observed that tenants in Kintyre were being inspired by their Irish neighbors to leave for America. 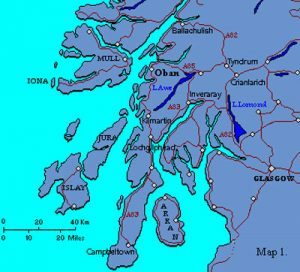 The island of Islay (or Ìle as it is properly called by its native inhabitants) came into the possession of Daniel Campbell, a Glasgow merchant and member of Parliament. It is little wonder that a man of this background would mount plans for a massive restructuring of the island with profit in mind. Rather than join into competition for leases, some of the tacksmen decided that they would rather risk their fate in America. copies of letters from persons who had emigrated several years before to America, to their friends at home, containing the most flattering accounts of the province of North Carolina, were circulated among them. The implicit faith given to these accounts made them resolve to desert their native country, and to encounter the dangers of crossing the Atlantic to settle in the wilds of America. In about 1767 a second and larger wave of migration began to flood the Cape Fear valley with Highlanders. This group was from a larger area of Argyll, including the islands of Arran, Jura, Islay and Gigha. With worsening economic conditions in the 1770s, the impulse to emigrate spread much further throughout the Highlands and Outer Hebrides. About 20% of the isle of Skye was lured away by tacksmen during this period, much to the annoyance of the landlords. Highland landlords (for by this time they could no longer be called “chieftains” in any meaningful sense of the word) possessed powers more unrestricted than any others in Europe, and many of them used this power to exploit their tenants. While economic conditions were poor throughout Britain, only in the Scottish Highlands were landlords able to use their authority to force people to leave their homes. From the late 1700s to 1850, Highlanders were a disproportionately large part of the Scottish exodus. In short, our lairds’ or landlords’ oppression will soon help to plant your colony … This part of North Carolina will soon be a New Scotland for within these three or four years there is an immense number come in to this place. The natives of the Highlands and Isles have always been remarkable for the strongest attachment to the place of their nativity, and for the highest respect towards their masters and superiors. In these, they were wont to find kind patrons and protectors, and cherishing, indulgent fathers to themselves and their families. This endeared them to a soil and climate to which nature has not been very liberal of its favours, insomuch, that they have ever shewn the utmost aversion at leaving their country, or removing to happier regions, and more indulgent climates. That this is true of the Highlanders, in general, will be acknowledged by those who are in the least acquainted with them. The cause, then, that could induce a people of this cast, to forsake their native lands, in such numbers, and make them seek for habitations in countries far distant and unknown, must, doubtless, be very cogent and powerful. And, here, let the present land-holders and proprietors consider, whether, of late, they are not greatly to blame? Whether they have not begun to shake the iron rod of oppression too much over them? … They are spurned away with looks expressive of the utmost contempt, or dismissed with a volley of oaths and curses, in a language strange and unknown to the most of them. I received a letter from John Bethune Let us all depart! Which pleased a man who didn’t even see it! I care not for the weak-hearted! Have emigrated to where they will find wealth in plenty. Who won’t tolerate their own tenants. In the help of the high-king, God. If it would turn a profit. As your relations have begun to do. And hard on their enemies. Once they reached America, they found a life and land quite alien to them. Gaelic poetry of the period frequently refers to America as the “land of the never-ending forest.” Although some parts of Argyll are wooded, there are very few trees on most of the Western Isles. Not only was the landscape strange and forbidding, they encountered many animals wild and hostile to them. The colonists who settled the land before them – English, Scotch-Irish, Germans, Huguenots, Swiss, and others — were similarly foreign and unwelcoming, wearing clothing and speaking languages unfamiliar to the Highlanders. And the herring fleet that sails by so winsomely. Pears and apples will grow fragrantly. Lacking kilt and hose: it is a pity. Of all of the aspects of their identity as Highlanders, most fundamental was their language. It was through Gaelic that they expressed their experiences as a community and as individuals, and had access to centuries of oral tradition in the form of song, poetry, legend, folktale, lineage, and so on, which embodied their collective past as a people. The vast majority of the emigrants spoke only Gaelic, although the upper ranks of Highland society were typically fluent in English. Such petitions were repeated from time to time until the area was finally supplied with the Reverend James Campbell in 1758. The Earl of Argyll had been actively promoting and developing the Protestant faith in the area of the Highlands over which he had influence since the 1560s. Protestantism was an important marker of loyalty to the British Crown and the majority of Highlanders in Argyll had been nominally converted to Protestantism by the time of the migrations. Were in pain in Egypt; When the Pharaoh rushed after them. The Highlanders were likewise departing across the ocean to escape oppression and hardship. Religion did not just provide solace: it was the church in particular which was to act as a major catalyst of change for Gaelic society both in the Scottish Highlands and in the immigrant communities of America.